The Thunder and Lightning Worksheet – Get our educational and fun FREE to download printable find hidden words puzzle game for your kids. 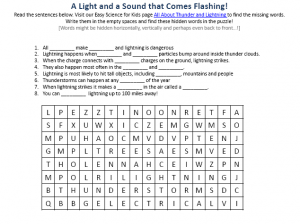 Our worksheet all about lightning and thunder for kids includes a fun missing word seek game as well as a find-the-hidden missing words game for kids. You are allowed to download, print and use the free to download find hidden words game unlimited times at no charge for school or home use. This fun facts about thunder and lightning worksheet for kids is suitable for Primary school kids in Grade 1 to 5 as well as for younger kids in Kindergarten and Preschoolers. Young children will enjoy learning fun facts all about thunder and lightning while playing the hidden words game. Kids in Elementary school from First Grade to Fifth Grade can use the free printable thunder and lightning worksheet for kids as a reading comprehension exercise. The kids will enhance their reading comprehension skills, and learn well about lightning and thunder, as they will most likely need to re-read a few times the thunder and lightning fun facts. Kindergarten kids and Preschoolers who haven’t yet learned how to read and write, can enjoy the free thunder and lightning find the hidden words puzzle as an interesting listening comprehension activity. Teachers or parents can play the missing words game with the kids and help them find the hidden words. Educators can read to the kids the thunder and lightning fun facts and then ask the kids to remember what the missing words are. After that, they had help their kids recognize and find the hidden words in the words seek puzzle. Parents can use this free to download worksheet all about thunder and lightning for kids to interest their kids in science and spend fun educational time teaching their kids about lightning and thunder. Teachers can use the free printable thunder and lightning worksheet for kids to make science lessons interesting and gain kids attention and interest in learning about thunder and lightning. By playing the find the hidden words game, children shall learn about thunder and lightning in a fun and interesting way, that makes science classes something to look forward to. Our fun facts about thunder and lightning worksheet for kids can be used by private tutors for after school science activities and extra-curricular education programs. EasyScienceforKids.com is the best kids fun science website with free to download printable science worksheets and find the hidden words puzzle games. Download and use our fun free science worksheets to make learning science an enjoyable and interesting experience for you kids! Thunder is often heard after lightning strikes.This is because the speed of light travels faster than the speed of sound. When lightning strikes, a hole in the air is made. It collapses after the lightning is gone. Thunder is what you hear when the hole collapses. Learn more fun facts about thunder and lightning by downloading the free printable hidden words worksheet! [sociallocker]Get our fun find the hidden words game about lightning and thunder for kids. Download the FREE Thunder and Lightning Worksheet for Kids! Did you enjoy the FREE Thunder and Lightning Worksheet? Read lengthy info about Lightning here. Declan, Tobin. " Thunder and Lightning Worksheet - Free to Download Printable Find Hidden Words Puzzle Game - ." Easy Science for Kids, Apr 2019. Web. 21 Apr 2019. < https://easyscienceforkids.com/thunder-and-lightning-worksheet-free-to-download-printable-find-hidden-words-puzzle-game/ >.